Who wants to start their own herb container garden? Everyone right?! Container gardens are great because you don’t need any actual LAND for them! Plus, they are mobile. If the weather is unfavorable, you can pull those suckas inside. It’s a win-win-win and I’m here to walk you through it. And we’re going to start from the VERY beginning. Yep - that’s right. No short cuts here. We are going to grow our herb garden from tiny little seeds. It’s going to be straight MAGIC. Well… touché. However, there are actually a lot of great reasons to invest a little extra time into starting plants from seeds. For starters, it’s cheaper and you also experience a HUGE sense of accomplishment. Plus, you can find heirloom or more obscure varieties of seeds online. (PLANT NERDS UNITE!!!) You can also buy organic/non-GMO and you can foster the health of your plant from it’s infancy. Pretty cool, right? I chose these because; well, because they’re my favorite! I will be companion planting them all except for the basil. Basil gets its own container. Why companion plant your herbs? Thyme, sage, and oregano are Mediterranean herbs that love the sun and have similar watering requirements. They prefer dryer soil than herbs like basil or parsley. Thus, they will thrive being planted together. And I just want a TON of basil so it get's a big container to itself. Starting plants from seed indoors is a great way to grow successful outdoor plants! Starting seeds indoors allows you to better control the variables to increase the likelihood of germination and your seedling's success! 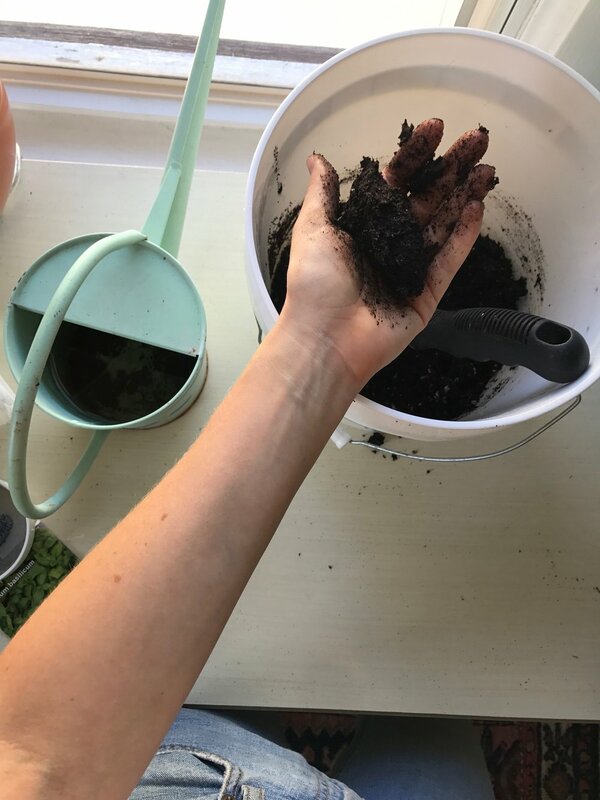 Also, if you will be transplanting the plants into a raised bed or actual garden, you will have them ready to roll when the weather is favorable! (When the warmer spring weather hits, for example.) This method of starting plants from seeds indoors can be applied to all variety of plants- from herbs to veggies to fruit plants! Germination is the budding of a seed after it has been planted into soil. Seedlings are the baby plants. Hardening off is the process of toughening up your plants for the great outdoors. A sunny, south facing window -or- a grow light with a timer if you do not have a sunny window. (Most seedlings require a lot of light!) I have an East facing window that gets the morning sun, but I got a grow light for the afternoon. How many days do they take to germinate? So you know when to start looking for them! If this is not on the packet, you can always look online! Keep your packets for reference. Fill cells or small containers with soil - about 1/3 an inch from the top. Mist the seeds with water. Adjust lighting to reach 15 hrs of exposure a day via sun and/or timed light. If you are using a timed light, set it for 15 hours a day. If you have some sun light, subtract the amount of time you have from 15 hrs and set your timer to that when they do not have the sun light. For example, I have 4 hours of sun light from my window. I will set my grow lights to be on for 10 hrs/day after that. Keep an eye on them and watch them emerge! Once the seeds sprout into seedlings, rotate them once a day to keep them from leaning to the window / light. If you are using a grow light, position your plant about 2-3 inches below your light. Adjust the lighting as your seedlings grow. You don’t want to take your seedlings directly from the protected indoors to the harsh climate! Once your seeds are about ready to be transplanted outdoors, place seedling trays in a protected outdoor spot (partially shaded, out of the wind). Bring them in at night. Do this every day for 7 - 10 days- increasing the outdoor exposure time each time. Now it's time to transplant into your containers!! In my next post, I'll discuss this as well as how to care for you herb plants to maximize their growing potential. PS, if you follow me and my work at Nourishing Minds Nutrition, then you may know that we are about to launch a membership community!! We will be diving in deep on all things hormones, digestion, and intuitive eating. Click here to learn more.